I have often made binoculars and spotting scopes from paper towel and toilet tissue tubes for my children. I don't think there has ever been a time when my children haven't gotten excited when I handed them a pair. This time, however, I think I blew their minds with a pair of homemade binoculars made out of pint size coffee cream containers and duck tape. 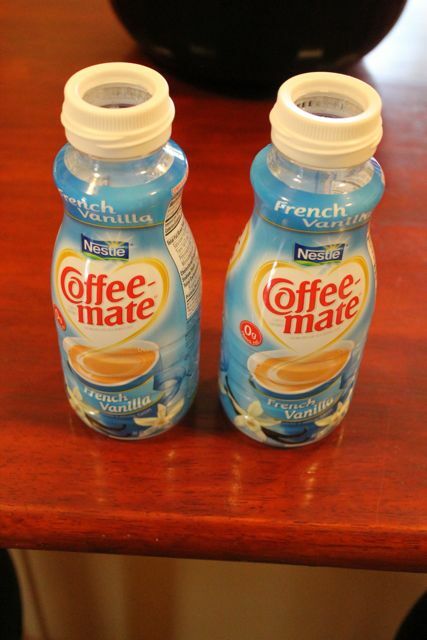 Start with two empty pint size coffee cream containers. I made homemade binoculars with Coffee-mate brand (clear) and International Delight (white) containers. They both work great! Remove the outer plastic labels. Make sure you wash the bottles and allow them to dry completely. 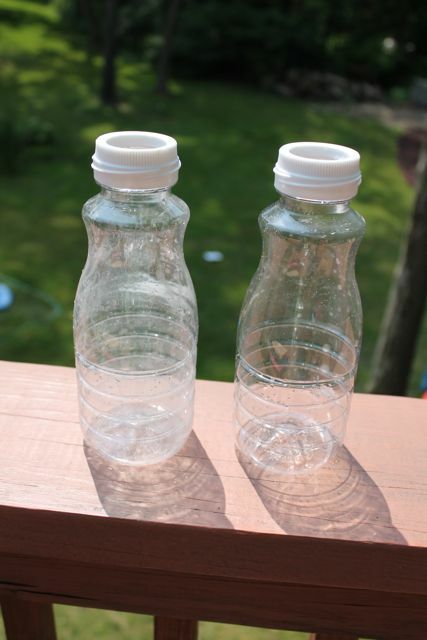 I placed my bottles outside in the hot sunshine to dry faster. 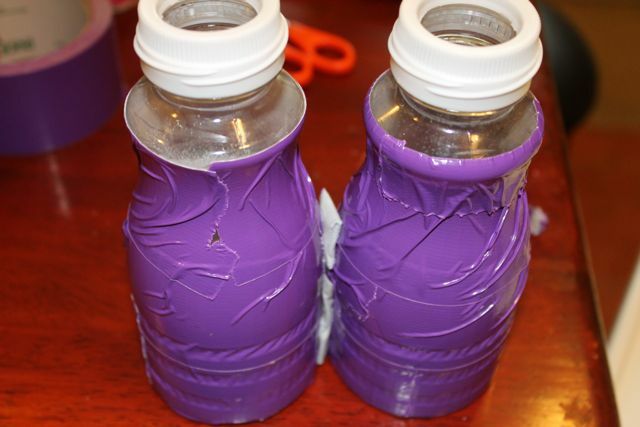 Next, cut off the end of the each bottle using a hacksaw, knife, or pair of scissors . The bottles already have grooves which made this very easy. I cut at the first groove from the bottom. 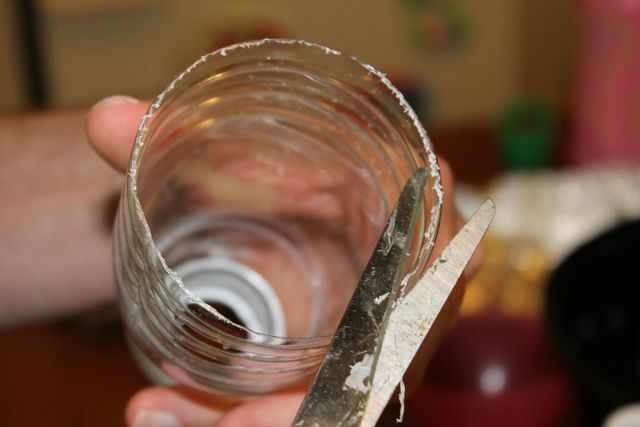 The edges of the bottle were a little jagged from the hacksaw, so I trimmed with a pair of scissors to make sure it was smooth. 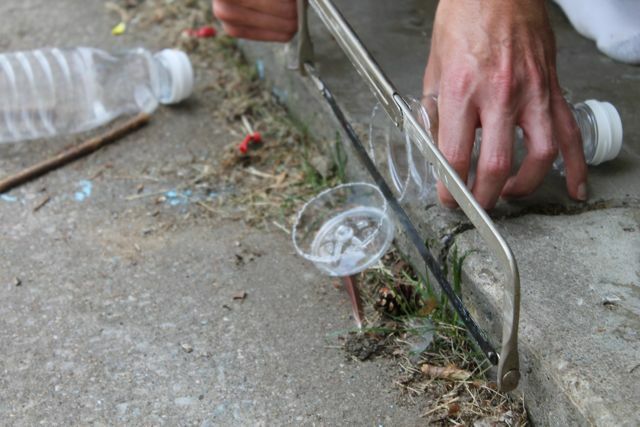 I later covered these edges with tape too. 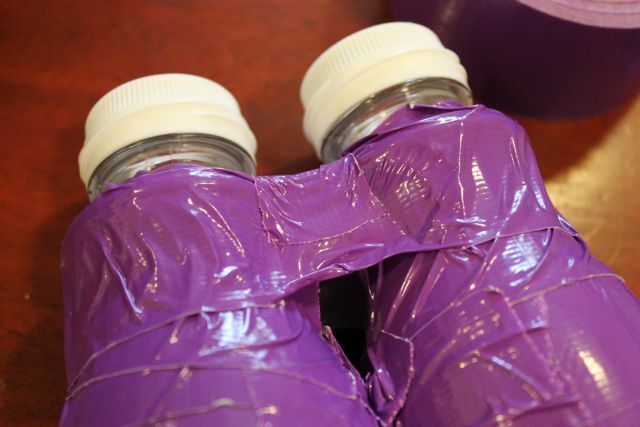 Wrap the bottles in duck tape. I rolled a few pieces of tape and placed on the side of the bottles to allow them to stick together. 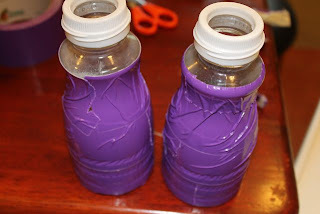 Then, I wrapped long pieces of tape around both bottles. I started in the middle of the binoculars to try to get the tape down in between the two bottles. The bottles were now secured together. I had my son try the binoculars on for size. The eye holes were a little wide, so I pulled them closer together by wrapping tape around the bottles near the top. 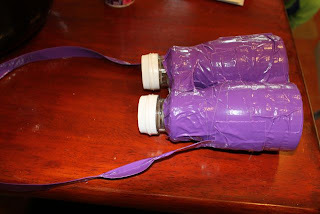 Lastly, I folded a long piece of duck tape in thirds and attached it to the bottles for a strap. The first thing he did was check out the birds at the birdfeeder! Actually, my older kids loved the binoculars too. They remarked that they felt just like real binoculars! 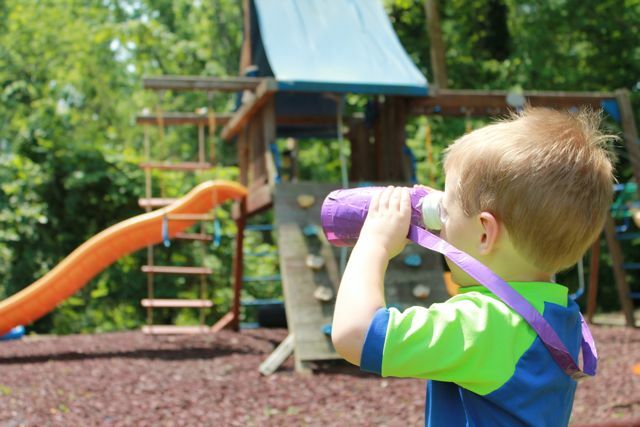 These binoculars are fun for every day play! But come Halloween time, you may just want to make an orange and black pair of binoculars and go on a ghost hunt! Please use the free printable below to print out the THREE GHOST FRIENDS. Included in the PDF download is a really big ghost, ghosts in primary and secondary colors, white ghosts and ghost shapes. 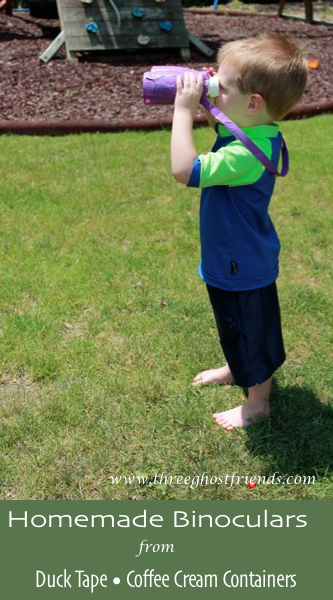 Hang the ghosts around the house or outside, and use the binoculars to have a fun ghost hunt!! Click here to download the ghosts! 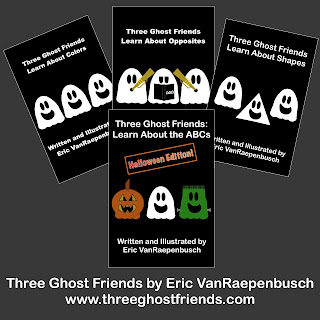 The characters from the printables are from my THREE GHOST FRIENDS series available as eBooks (iBookstore and Kindle Store) for only 99 cents or print versions from Amazon.com (some titles are on sale for as low as $4.80 (as of June 22, 2013)! 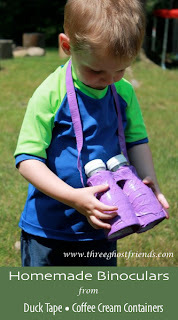 I really like how you made binoculars with different materials! I've already pinned this to try out soon. :) Thanks so much for sharing it at Stress-Free Sunday! Thank you Mary! I really appreciate the repin! 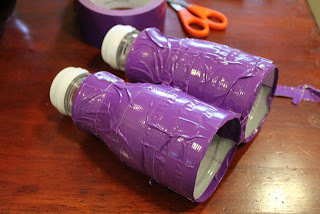 Sophia said, this is really a fabulous way of making binoculars for the kids and I think this binoculars will be the perfect one for our kids and alsolutely it will be easy to make for them as well. Thanks mate for letting us know about this issue. his usually his usually comes as a shock to most beginners because they normally assume that astronomy is the domain of telescopes not binoculars. binocular for concert comes as a shock to most beginners because they normally assume that astronomy is the domain of telescopes not binoculars. If asked, most people would turn down help when selecting a pair of binoculars. Most likely, their predominant selection criteria are based upon either magnification or the price. After all that is all there is to it, right? Nice and informative post, thank you for sharing it with us.